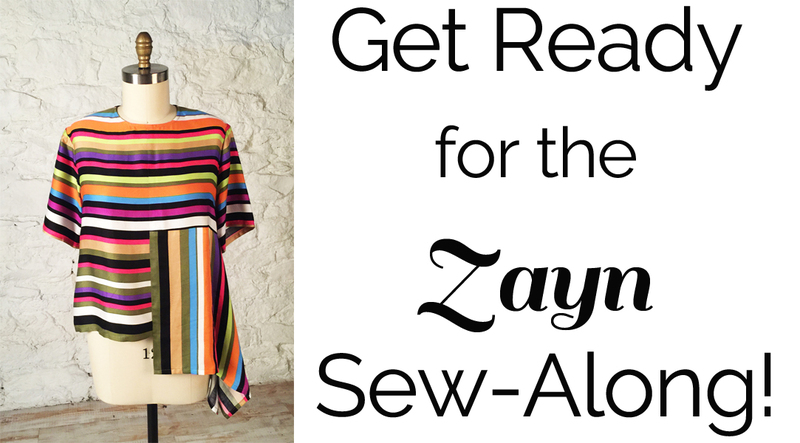 This summer we hosted our very first Sew-Along for our newest pattern, the Zayn Top. Our goal was to break down the instructions with step-by-step photographs to make sewing the Zayn even easier. We also wanted to include some of our favorite techniques – things that we can't fit in our regular pattern instructions. The best part, by far, has been our Sew-Along Facebook Group where everyone who is making a Zayn can ask questions and share their projects. We have had a few finished Zayn's pop-up on Facebook so far, which we wanted to share with you. We hope you keep the pictures coming. We want to see your finished projects! Zayn Sew-Along Steps 25 - 28 – Let's finish this! ​One of the great things about our Sew-Along Facebook Group is that we are able to hear your questions about the pattern. We noticed that many of you wanted to adjust the dropped shoulder that we have designed into the Zayn, and were unsure of how to go about it. So before we attach the sleeve, we are going to share with you our technique for armscye adjustment to use on your next Zayn – or any other pattern! Then we will go through the process of actually attaching the sleeve and you will have a finished top. So let's get started! ​The neck binding is really the only part of the Zayn instructions that are radically different for the woven and the knit versions. I'm going to show the woven steps first. If you are making a knit, scroll down to that section. WOVEN Step 23: Press your Neck Binding piece lengthwise with the wrong sides together. Before you start pinning, we recommend you prepare your neck binding. Start by laying the folded strip in a curve (with the folded edge on the outside) on a pressing surface. Then, preshape the strip by steaming the curved bias. This reduces some of the extra fullness along the raw edges, and allows the bias to lie flatter. ​Are you ready to start sewing your Zayn top? Hopefully you have already downloaded and assembled the pattern, and cut out the fabric. Now we are ready to breeze through steps 1-5 of the pattern! A few notes: I will be making the Zayn in both a woven and a knit version. Most of the instructions are applicable for both substrates so the bulk of my images will be using woven material. However, if there is a step that is knit-only or woven-only then I will show images of the knit. Look for Woven or Knit in front of specific instructions. Also, don't forget to join us on our Sew-Along Facebook Group. It is a great place to share your project, ask questions and keep up with what everyone else is working on. ​Are you ready for the next phase of the Zayn Sew-Along? Remember, you can join any time – these posts won't be taken down, so even if you are just following along now, you can sew when it is over. Also, have you joined our Sew-Along Facebook Group? It is a great place to meet new online sewing friends and get help when you need it. And we would love to see photos of your Zayn progress, so don't be shy, post them on the group! ​Welcome back to the Zayn Sew-Along! The last time we met I told you how to assemble your digital pattern. Now we need to talk about preparing your fabric, cutting out the pattern and marking. Now, for many this is the most dreaded part of any project. I must admit, it's not my favorite part but it can make or break a project. A well cut out pattern is key to a successful garment. Welcome to our first ever Sewing Workshop Sew-Along – I'm so excited to sew with you! Through the next few weeks I'll be sharing our favorite tips and tricks for making both the woven and knit versions of our Zayn Shirt. Before we can start sewing, however, we need to make the actual pattern. For those of you who have never used a digital pattern before, read along for instructions on how to use a download pattern. 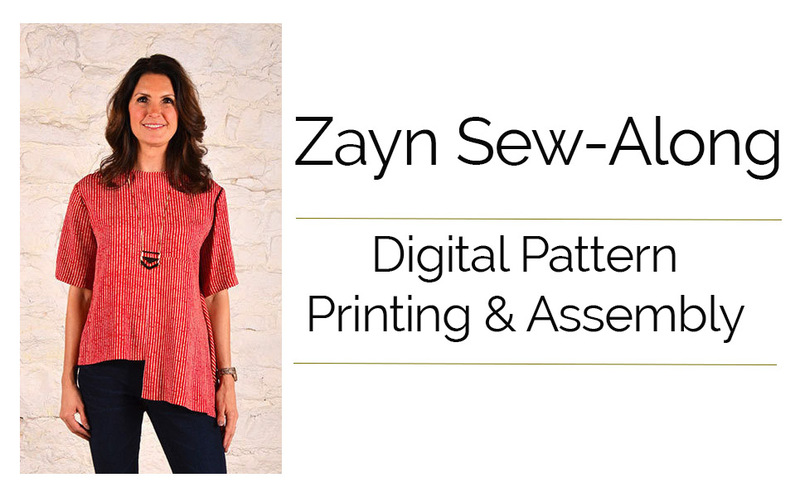 We are so excited to announce that we are going to host our very first sew-along, featuring our new Zayn pattern! We hope you join us on our sewing journey as we work our way through this fun shirt - making both the woven and the knit versions. Over the next few weeks we will explore the pattern instructions step-by-step, and I will share with you our favorite tips and techniques. Here it is, the one you've been waiting for...The Zayn Shirt. This split personality top is perfect for those who want to be classic and modern, all in the same garment. The short sleeve garment drapes from its flattering high, curved neckline and plunges into a gorgeous drape on the left side. And, this is a garment you don't have to take sides on – it is suited for both wovens and knits!